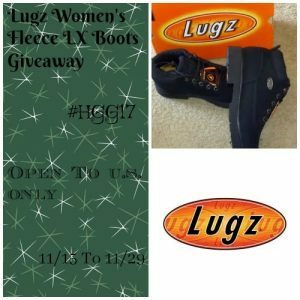 Welcome To Our Lugz Women’s Fleece LX Boots Giveaway! I have finally found a shoe brand that I am in love with and it is Lugz. The way that are constructed to the way they feel when you wear them is awesome. They hold up with almost anything that you throw at them such as chemicals and other things. I know this first hand because we did that. I know that was more than you wanted to know about their shoes. You can read Tammie’s review by going HERE. Happy Holidays! Disclosure- Tammie’s Reviews, Giveaways and More and the participating bloggers were not compensated for this post. No purchase is necessary to enter. One entrant per household, per IP address. All entries will be verified. Void where prohibited by law. Winner will be contacted by email; Please add pankuch1605@hotmail.com to your whitelist. This giveaway is in no way administered, sponsored, endorsed by, or associated with Facebook and/or Twitter, Google, Pinterest, or any other social media platform. Please contact Tammie at info@tpankuch.com to see your product promoted here in a giveaway. We have a few traditions. One, is we always take a family photo…have for 42 years. Another, we have ornaments from when my sister and I were little, and we always place them on the tree. Yet, another, we always get together on Christmas Eve, because it’s my mom’s birthday…and the day before Christmas. Our big get together is Christmas Eve, our family, intimate, get together is Christmas day.